It’s that time of year folks. No, not the time to hit the gym for your New Year resolution. It’s time to get prepared for new changes coming to e-commerce. Ever since Amazon emerged in 1994, e-commerce has constantly revolved around new technology and even stronger customer expectations. As we shift toward the end of the year we can expect more focus on the customer experience. That means personalizing the buying experience from the moment a customer visits your online store to delivery. You’re probably wondering how that’s possible. SalesWarp’s latest update, Series 4, provides a centralized hub for all of the data to make your customer’s shopping experience unique and seamless. Get your store in shape before the holiday season with these five trends for 2019. When was the last time you clicked an ad from your favorite store that showed products that were completely irrelevant based on your last visit? Or opened a newsletter that greeted you by a number instead of your name? 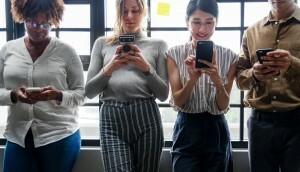 According to a study by Barilliance, the conversion rate of visitors who click on recommended products is over five times higher than the conversion rate of non-clicking customers. E-commerce stores are starting to stray away from funneling all of their consumers into one category by creating unique customer experiences across all touchpoints. There’s no better way to differentiate your store from competitors than by delivering a unique shopping experience where customers can easily find the products they need. Tailoring content by using customer data such as browsing history, prior purchases, and demographics will ensure that your advertised products are less generic, creating a long-lasting relationship with customers. The key to e-commerce personalization is data. Everything from location, purchase history, and personal characteristics are vital for a successful approach. Don’t think you need to keep a record of all this data? Over 70% of companies use personalization in some form based on their customer data. That’s a tough competition for the remaining 30% of e-commerce retailers. The biggest issue a lot of businesses face is not being able to consolidate all of their customer data. Without a simple view of each segment of data, you’ll risk turning away customers with irrelevant products and the possibility of capturing new ones. This is where SalesWarp stands out among other management systems. SalesWarp delivers accurate real-time customer data across all of your sales channels so you can create a memorable experience for each unique customer that will keep them craving for more. Having the ability to access data on any device makes SalesWarp an all-in-one solution for tracking your customer data, products, and more. Gone are the days of manually entering every single order from a spreadsheet or spending hours working on a simple task. E-commerce automation consists of tools and programs that will help you save time and money by automating processes that would usually take twice as much time to complete. As customer demand rises so does the amount of time and labor to fulfill orders when using different systems or outdated programs that can make a simple process a chore. As your store grows you may notice a system that once worked in the past may not be as effective today. It’s important that time is leveraged appropriately and not wasted on tasks that could be finished by the click of a button. Automation is the future of e-commerce, by not only saving time and money but allowing your store to scale beyond expectations. Reduce time-consuming processes and increase customer loyalty with SalesWarp’s automated workflow feature. Enter orders, make changes, and ship to multiple addresses in just one menu. Connect your warehouses, stores, and sales channels into one system to increase productivity and eliminate problems before they happen. Unlike other SaaS applications, we make it a priority to learn the ins and outs of your business to create unique customizations that will get the job done faster for your team. Focus on growing your company while SalesWarp handles the rest. 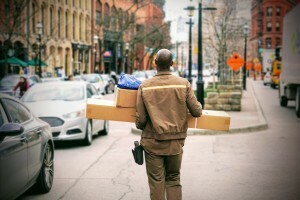 Circling back to Amazon which set the standard for same day shipping during the holiday season, many retailers today offer same day or accelerated shipping as they try to go above and beyond customer expectations. Offering same day delivery and accelerated shipping can be a challenging process. Your store needs to have a reliable inventory management system, optimized fulfillment, and efficient automation to send orders out of the warehouse and into your customer’s hands by the end of the day. You’ve read earlier about how SalesWarp can track all of your data in real-time, this also includes inventory which is a key element into making sure you’re not overselling your products. No one wants to read an email stating that a product you ordered is out of stock and will take even longer to arrive. Give your customer’s more fulfillment options with SalesWarp’s integrated in-store fulfillment software that will give customers better options for delivery based on their proximity to the distribution center or warehouse. Store associates can also fulfill orders from stores as soon as they receive the order placed into SalesWarp’s system. The last but not least emerging trend for e-commerce is the rise in mobile shopping. You’re probably reading this on your smartphone right now. Imagine the volume of orders that are received from just a press of a thumb. In fact, over a third of retail sales will be impacted by smartphones, according to a report by Forrester. So what does this have to do with my store? By this point, you’ve learned that the customer experience is more often shaped by changes in technology but there are ways to improve your store’s impact on a person. Effective website design will keep visitors glued to your page instead of bouncing to other websites because their expectations weren’t met. Mobile shopping provides a unique set of advantages for your store from unlimited payment options to a better multi-channel experience. Reduce the cost of a design department and let the SalesWarp team provide expertise, design, and implementation for your mobile store. SalesWarp is fully integrated with high performing e-commerce platforms including Shopify, BigCommerce, Magento, and Zoey). 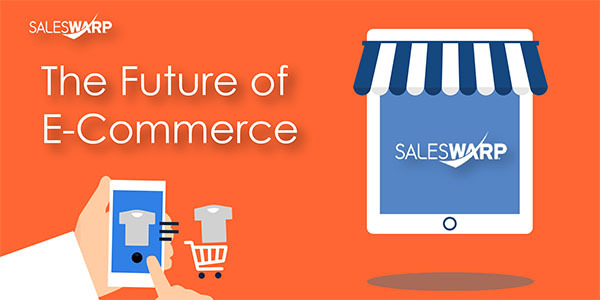 It’s hard to predict how e-commerce will change in the future but these trends are quickly being adopted from retailers. Learn how you can be ahead of the competition with a SalesWarp demo today!